What’s the difference between EMA, PMA, and PMAxx™? Viability PCR originally used EMA (ethidium monoazide) to inactivate dead cell DNA. Biotium developed PMA (propidium monoazide) in collaboration with investigators at Montana State University (Nocker et al. 2006). PMA is more selective for dead cells than EMA, and became widely used for selective detection of viable microbes and viruses. PMAxx™ is Biotium’s newest viability PCR dye, designed to be more effective than PMA at eliminating PCR amplification of dead cell DNA. Therefore it provides the best discrimination between live and dead bacteria. Learn more about PMA and PMAxx™ for viability PCR. What light sources can I use for photolysis of PMA or PMAxx™? Biotium offers the PMA-Lite™ LED Photolysis Device for light-induced cross-linking of PMAxx™ and PMA to dsDNA. The PMA-Lite™ is designed for samples in microcentrifuge tubes. We also offer the Glo-Plate™ Blue LED Illuminator for photoactivation of larger tubes, 96-well plates, or other plate formats. Commercial halogen lamps (>600 W) for home use have been employed for photoactivating PMA in some publications, though results have not been consistent due to inevitable variation in the set-up configurations. If you decide to use a halogen lamp, we recommend that you lay tubes on a block of ice set 20 cm from the light source, on a rocking platform to ensure continuous mixing. Set the lamp so that the light source is pointing directly downward onto the samples (up to 45° downward slant is OK). Expose samples to light for 5-15 min. PMA is a high affinity photoreactive DNA binding dye developed by Biotium for viability PCR (40019). PMAxx™ is our new and improved viability PCR dye (40069). The dyes are weakly fluorescent by themselves but become highly fluorescent upon binding to nucleic acids. Upon photolysis, the dye forms a stable covalent bond with the DNA, thus resulting in permanent DNA modification. The dye is cell membrane-impermeable and thus can be used to selectively modify DNA from dead cells with compromised membrane integrity, while leaving DNA from viable cells intact. PMA and PMAxx™ inhibit PCR amplification of modified DNA templates. Consequently the dye is useful in the selective detection of viable pathogenic cells by quantitative real-time PCR. 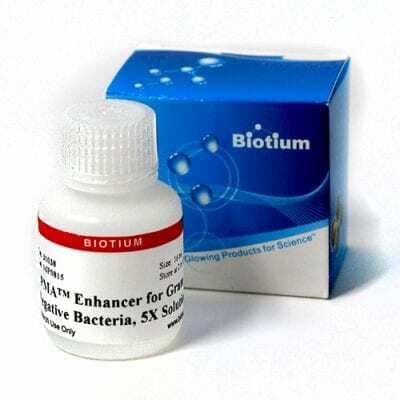 PMA Enhancer for Gram Negative Bacteria was designed to improve PMA- and PMAxx™-mediated discrimination between live and dead gram-negative bacteria. PMA Enhancer is provided as a 5X solution, and is added to a sample before the addition of dye. When a sequence from a gram-negative bacteria is amplified by PCR, samples pre-treated with Enhancer show a decrease in the signal from dead cells, with no change in the signal from live cells. Thus, PMA or PMAxx™ plus Enhancer is the optimal way to perform viability PCR on gram-negative bacteria. The mechanism by which Enhancer improves live/dead discrimination has not been determined. It may improve passive permeability of dead cell walls or membranes to the dye, and/or improve access of the dye to the dead cell DNA. E. coli were killed with mild heat treatment (56°C for 3 hrs) and treated with PMAxx™ or PMAxx™ + Enhancer, followed by light exposure using PMA-Lite™, DNA purification, and qPCR with Fast EvaGreen® qPCR Master Mix. dCt values were calculated by subtracting the Ct without dye from the Ct with dye. Only dead cells treated with PMAxx™ + Enhancer showed a large dCt, indicating that the dye successfully inhibited PCR of dead cell DNA. Note: PMA Enhancer is not intended for use when gram-positive bacteria are to be detected. PMA Enhancer may adversely affect the amplification of live cell DNA from gram-positive bacteria. For photoactivation of PMA, PMAxx™ or EMA dye, we recommend the use of Biotium’s PMA-Lite™ LED Photolysis Device (E90002), which is designed to conduct photolysis under controlled conditions. Also see our PMA Real-Time Bacterial Viability Kits. Materials from Biotium are sold for research use only. 1. Nocker, A., et al. Comparison of propidium monoazide with ethidium monoazide for differentiation of live vs. dead bacteria by selective removal of DNA from dead cells. J. Microbiol. Meth. 67(2), 310-320 (2006). 2. Nocker, A., et al. Molecular monitoring of disinfection efficacy using propidium monoazide in combination with quantitative PCR. J. Microbiol. Meth. 70(2), 252-260 (2007). 3. Fittipaldi, M., et al. Progress in understanding preferential detection of live cells using viability dyes in combination with DNA amplification. J. Microbiol. Meth. 91(2), 276-289 (2012).